Few things are as intrinsically American as a homemade grill, and nothing ties us to our past as barbeque stake. The only problem is that we have wondered so far from the days of old that it is nearly impossible to cook on a grill without paying a visit to that one friend that has a big house with a back garden or traveling hundreds of miles to the nearest wildlife park. Still, there is one alternative that anyone with a balcony can employ and that is a gas grill. You will lose some of the flavor that an actual charcoal grill has, but you will still be able to get those wonderful grill marks and keep just the taste of the meat cooked alone on a high heat fire, that you simply cannot replicate in a pan on the stove. And if you want to replicate the flavor of smoke you can use one of the Top 10 Best Electric Smokers of we have already talked about. 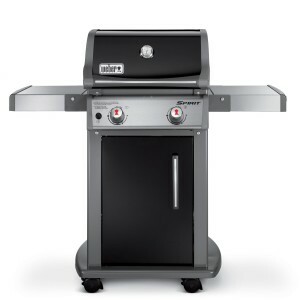 Needless to say, we have had a lot of fun testing and coming up with the following list of the top 10 best gas grills under $500 that you can find on the market in . We have given you all the important details about each grill in the list below, but make sure to also scroll down, past the table, to our in depth reviews for each product. The Weber 46110001 Spirit is the most expensive product that you are going to find on our list, but, if you have the money for it, it is definitely worth it for several reasons that we are going to go into now. For one, it has 2 high power, stainless steel burners that can create 26,500 BTUs per hour at maximum capacity. The cooking area has a wide 360 square inch grate made from porcelain enameled cast iron. That means it is extremely tough but also that your stake will not get stuck to it while cooking and it is extremely easy to cook. It also has 2 side tables that can be folded down for storing and then you can lock them in their upright position so they will not fold down, no matter what you put on them. Another interesting feature is the crossover ignition system, that allows you to turn on the second burner from the fire going on in the first burner. You can also start any one of the burners with the Weber 46110001 Spirit’s electrical ignition system. Let us close with the fact that having 2 burners means you can cook different foods at different temperatures, or you can quickly switch from the high temperature burner to the low one after you have created some nice grill marks. 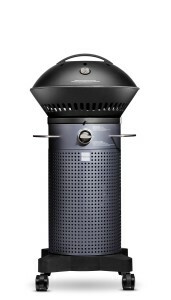 The first thing that we need to point out about the FUEGO FELG21C is that it was designed by Apple’s former Chief Designer Robert Brunner, and although we are not the biggest fans of his work at Apple, we think he managed to create a pretty nice gas grill. He managed to create a very tight, easy to store, double burner gas grill that can reach 500 degrees Fahrenheit in 5 minutes. That basically means you can cook faster on the FUEGO FELG21C than if you were to cook on your stove. And the innovations do not stop here because the Fuego can actually work for 20 hours on a single charge of gas due to its extra efficient burners. The Dyna-Glo Black & Stainless Premium Grills is a slightly bigger gas grill, but it still has some interesting and useful features so we decided that we would feature it on the third spot of our best gas grills under $500 list. 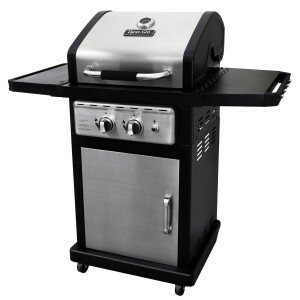 It is a little too big to be a good apartment grill, and if you are going to have a grill in the back yard it would be better to have a charcoal one, but still, it does have a double burner system and it is able to reach 30,000 BTUs of heat. It also has the two folding side tables that you can use to sit your meat down before and after cooking, and it does have 547 square inches of cooking space. So, as long as you have the space for it, and the need for a huge grilling space, the Dyna-Glo Black & Stainless Premium Grills is the perfect choice for you, but otherwise, it is a bit too large for its purpose. We guess that even Dyno-Glo realized that their initial product was a little bit too big, so they created the Dyna-Glo DGB390SNP-D Smart Space Living. It is the first gas grill on our list that goes below the 250 dollars mark and we are going to stay well below this limit for several products from now on. Considering the price the Dyna-Glo DGB390SNP-D Smart Space Living is the best gas grill in its category, with its 507 square inch cooking space and 3 burners producing a total of 36,000 BTUs of heat. The lid has a double liner system that keeps the heat in so slow cooking becomes a breeze. We have been talking a lot about how important it is for a gas grill to fit your balcony, but what if you do not even have that? Then you will need a very good range hood to clear up any smoke that the grilling may create. Just to make it clear the Cuisinart CGG-306 is not and cannot be used as a gas range, so if you need one of those you will need to check out our Top 10 Best Gas Ranges list. 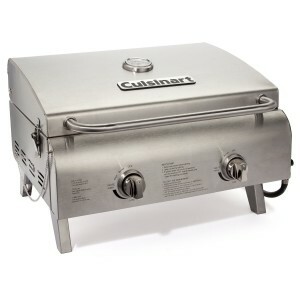 The Cuisinart CGG-306 is actually a perfect grill, with a stainless steel cooking grate that will help a lot if you are trying to get those perfect grill marks on your stake. 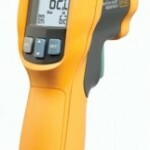 It is fairly small so it can only generate 20,000 BTUs of heat, but that is enough for most stakes and recipes. Once you are done with it, you can fold the legs away and it becomes even smaller for storage. 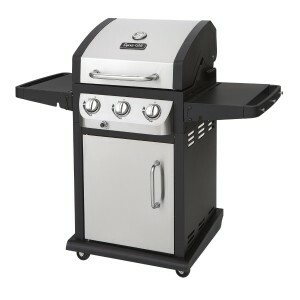 Now that we have started looking at compact, affordable gas grills, we need to introduce the Weber 50060001 Q. 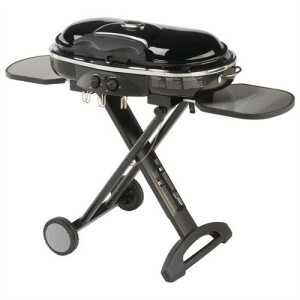 It is the smallest gas grill you could use, developing a maximum of 8500 BTUs per hour for its 189 square inch grate. That is pretty small but more than enough if you are a family of two who enjoys barbeque every other day. And it actually looks so good that you can keep it on the kitchen counter at all times. Ironically the existence of the Coleman RoadTrip LXX Grill defeats all the prejudices we had as we had when we started looking at grills for our list. It has a 4.4 rating from almost 100 customers on Amazon, so there are a lot of people who actually go on road trips and prefer to take their grills and some gas source. 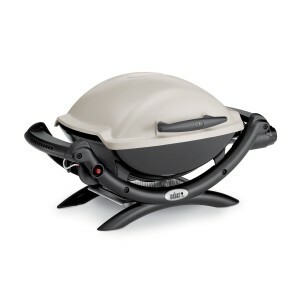 And if that is you than the Coleman RoadTrip LXX Grill is actually a perfect choice because it is very compact when its legs are folded, and it becomes a very tall and comfortable grill when in use. 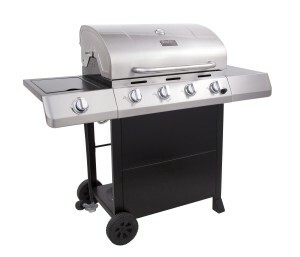 The last three gas grills we are going to talk about are extremely powerful and large. The Dyna-Glo DGE is the most expensive of the three and it is only normal since it uses 5 straight tube burners to heat up its massive 708 square inch cooking space. 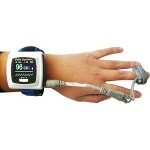 The thing we like the most about it though, is the fact that it uses thick, 3 piece grate made from 7 mm stainless steel. 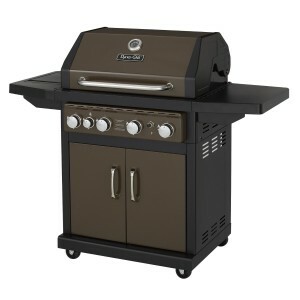 The Char-Broil Classic 480 generates 480 BTUs of heat, on its 480 square inch cooking space on the main grill, and has a second 180 square inches grill to the side of the main grill. What is even more interesting is the fact that the Char-Broil Classic 480 has a second grilling shelf on top of the main grill, and you can use it to heat up the bread as you are cooking the meat. 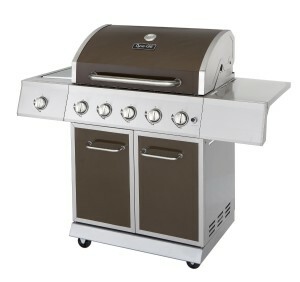 So finally, we need to talk about the strongest, biggest gas grill on the market in , the Dyna-Glo Bronze 60,000 BTU. It generates 60,000 BTUs of heat per hours and it has a 667 square inches of cooking space. It uses 4 burners to generate that type of heat and you can control the heat generated by each one so you can cook 4 types of meats at the same time without any problems. It is one of the most stylish gas grills on the market so, if the extra big size does not create any types of problems for you, than the Dyna-Glo Bronze 60,000 BTU might be an excellent choice.